This seafront villa offers 230 square meters of indoor living space as well as plenty of partly shaded space on the outside terrace. Even at full occupation the considerable space ensures for guests to escape in peace and quiet, making it ideal for families, friends traveling together. The sea is only one minute away: a few steps through the garden lead you to the sea and beach platforms. 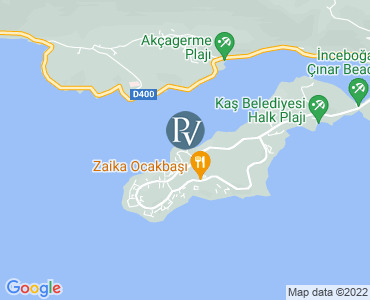 The villa is located on the Bay side of Kas Peninsula (Cukurbag Yarimada in Turkish). This side of the Kas Peninsula is sheltered: less windy and the sea is perfect for swimming, also early and late in the season. It is a very peaceful location, which is popular by people who like to enjoy their holiday without the street noises, noisy bars and still be only a 10 minute dolmus ride from the town centre. The picturesque harbour town Kas (Antiphellos in the Greek era) is renowned for its natural charm at the Turkey Rivera. It has an attractive harbour front along which tea gardens, cafes and restaurants are to be found in abundance. Leading away from the harbour is a warren of winding cobbled streets full of colorful shops offering all manner of carpets, ceramics, arts and crafts. Kas has remained relatively unspoiled since, until recent times, it was only possible to reach there by sea or on horseback. Modern kitchen equipped with fridge/freezer, microwave, washing machine, oven, stove, dish washer, grill. The villa shares a large garden (3500 m2) and the beach with four other villas. This villa is close to the Club Hotel Barbarosa hotel in Kas and benefits from all the services available at the hotel, including full room service. While the villa does have self-catering capabilities, breakfast lunch and dinner are available either at the Club Hotel Barbarosa or can be served in the villa. Please ask for a quote. For room service at the villa, please add 15% service charge. This villa is close to the Barbarosa hotel in Kas and benefits from all the services available at the hotel (including room service - see 'Extra Info' above). Children must be supervised in the pool area at all times. Wheelchair inaccessible. One of our favourites! The original town of Kas was founded on the remains of ancient Antiphellos and, as with Kalkan, has the striking Taurus Mountains as a backdrop and faces the crystal-clear waters of the Mediterranean. The little port town has developed over the years and has become the region's main tourist attraction, boasting a brand new state-of-the-art marina opened in 2011. The town itself is bigger than Kalkan but retains its idyllic ambience, providing an eclectic mix of ancient history and sophisticated refinement. Historically, Kas was a small port located at the southern tip of Lycia. In ancient times the town was known as Habesos, with it being renamed Antiphellos in later years. It is said to be one of Lycia's oldest settlements and protected by a breakwater served the ancient cities of Pinarbasi and Phellos. Naturally, because of the town's historical location, there are many ancient treasures to be explored. Right in the centre of the old town is a five-meter tall rock-carved Lycian sarcophagus dating from the 4th century BC. There are Lycian tombs nearby, an ancient shipwreck, the still used Greek amphitheatre, and more. Stroll around the town's attractions and charming shops during the day, and have enjoyable nightlife after the sun goes down. A range of restaurants and bars are within seconds of one another and the promenade by the old harbour is idyllic.